The stage is officially set for arguably the biggest high school football game in Las Vegas history. Bishop Gorman (5-0), which entered the week ranked No. 2 in the nation by USA Today, now can focus on facing defending national champ and No. 1 rated St. John Bosco of Bellflower, Calif., after crushing previously undefeated Santa Margarita, 41-10, on Friday night at Fertitta Field. The Gaels host the Braves (3-0) on Friday night at 6 p.m. in a game that will be nationally televised on ESPNU. The Gaels certainly won’t get any argument from Santa Margarita on that account. The visiting Eagles (3-1), who lost in 34-31 in double overtime last year to Bishop Gorman, never were really in this one after the first half as the Gaels defense took away the middle of the field from Santa Margarita’s standout junior quarterback K.J. Costello. The 6-foot-5, 220-pound Costello had carved up the Gorman secondary a year ago, passing for 439 yards and four touchdowns with many of completions coming on 25-yard lasers down the middle to streaking wide receiver Kyle Sweet (14 catches, 300 yards). But the Gaels took away the middle this time, content to let Costello nibble with short outs and curls. 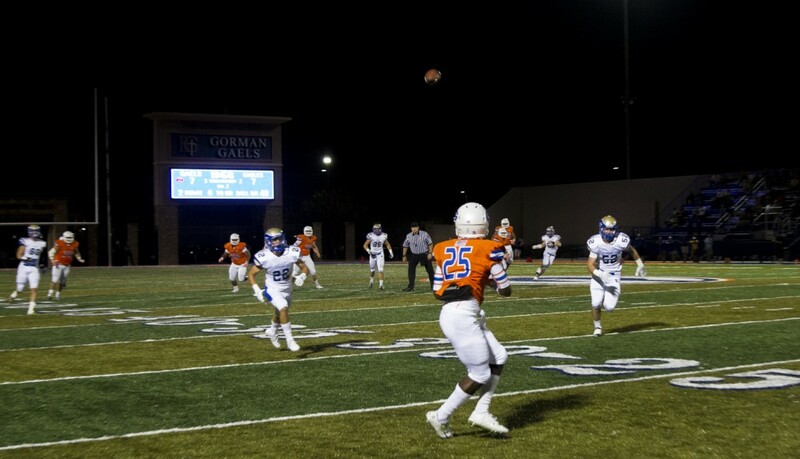 Gorman also had Costello on the run much of the game with a strong pass rush led by sophomore defensive end Haskell Garrett and junior linebacker Ikem Okeke and deflected a handful of his passes. Costello finished 24-of-46 for 297 yards but didn’t throw a touchdown and was intercepted once by the Notre Dame-bound Fertitta. Sweet, meanwhile, caught 10 passes for 174 yards but had one game-changing fumble. With the game scoreless midway through the first quarter, Costello hit Sweet streaking up the left sideline for what looked like a touchdown. But just as Sweet got to the end zone, cornerback Jabari Butler caught him from behind, striped the ball away and recovered it for a touchback (SEE VIDEO HIGHLIGHTS ABOVE). On the very next play, Martell did a pretty fair Frank Tarkenton impression, rolling to his right, then scrambling back to the middle of the field where he threw a pass about 50 yards in the air to a wide open Tyjon Lindsey who scooted into the end zone to complete a 80-yard touchdown pass play that gave the Gaels a 7-0 lead. “What a swing,” Sanchez said. “Unbelievable. But that’s how it’s been all year for us. Santa Margarita came back to tie it, 7-7, on a one-yard run by Matt Mark on 4th-and-goal but the Gaels came back two plays later to make it 13-7 when Martell again hooked up with a wide open Lindsey for a 48-yard touchdown. The PAT was missed. Didn’t matter. Gorman extended the lead to 20-7 on its next possession when Martell hit Cordell Broadus for a 27-yard touchdown. Santa Margarita closed to 20-10 with a 20-yard field goal by Sweet, but Gorman’s defense and run game dominated the rest of the way. Senior tailback Russell Booze, who finished with 156 yards on just eight carries, scored on runs of 13 and 82 yards while junior Jonathan Shumaker added a 33-yard touchdown run that made it 41-10 with 10:14 to go. It was about that time that most fans at Fertitta Field were starting a countdown to Friday’s showdown with Bosco.